As of this writing, the most likely scenario is that Obama will be reelected, but Romney will win the popular vote. Now, you might think this would make me happy as I stated early I’d be voting for Obama. It doesn’t. As in 2000, this situation would be wholly repugnant to me. Why? Because the Electoral College serves no useful purpose. Why go through the entire process of a popular vote only to have to add a step that, if the election is close enough, might reverse the popular vote. Part of the issue is the way in which electoral votes are generated. Basically, when you vote for a candidate, you actually vote for a slate of electors who then commit to voting for the president and vice president when the electoral vote is taken about a month after the election. In most, but not all, states, the winner of the popular vote wins all electoral votes that state has to offer. And as we wind down our election season, you’ll notice I live in the state that quite likely will decide who will be president on January 20, 2013. You’re welcome. But it should not be that way anymore than New Hampshire and Iowa should hold that much sway over who becomes the nominee for each major party. If I’m voting for president, I want to vote for the candidate, not some guy who commits to voting for the candidate. There are those who point out that the Electoral College is not bound to the popular vote. Technically, that’s true. There have been so-called “faithless” electors in the past, but they are few and far between, and the consequences to the person who bucks the vote he committed to in order to earn the position are generally severe. The last serious faithless elector was in 1976, when an elector refused to vote for Gerald Ford and voted for Ronald Reagan instead. A more recent example was the guy who voted for the wrong vice president as the president and vice president ballot separately when the electoral vote is taken. But why even have an electoral college when the net effect is to confirm the popular vote. Some would say it’s the only power remaining to the states. However, the states no longer choose our senators (except upon the death, removal, or resignation of a senator, when governors generally appoint a replacement). We do. The last thing I want is a state making a decision for me when my experience with state governments, specifically Ohio, has been roughly akin to watching monkeys try to learn how to use tools. But let’s back up a bit here. The whole primary process is a sham, as are the caucuses. Local news anchor Ben Swan ran a series of exposes on the Republican Party’s handling of Ron Paul and the process that named Mitt Romney the standard bearer for the party. If the rules had been properly followed in several states, Mitt would have had to endure several ballots before securing the nomination, something we haven’t seen since the 1970’s. The conventions were intended to choose the party’s nominee, not function as the choreographed pieces of stagecraft they are today. Instead of the primary system, which is joke anyway, let’s try this: In January of election year, we have a cattle call for candidates. Anyone who wants to be president runs. You vote in that race regardless of party, since parties have nothing to do with the Constitution anyway. There’s nothing that says we can’t have political parties, but there’s also nothing obligating us to preserve them. If the top four candidates garner, say 10% or more of the vote, those four have a run-off in June of election year. Those four, and only those four, can run in this election. If only one candidate gets that much of the vote – Let’s say he or she gets 95% of the vote (100% or even 99% is so statiscally unlikely, we should not even consider it) – then the closest runner-up is the only one that survives. There is no June run-off. We just have the November election. On the first Tuesday of the first full week in November, we pick either from those two or the two top vote getters of the June run-off. Think about that. We could have two black candidates, two female candidates, two Republicans, two Democrats, or even two non-major party candidates. It happens in mayoral elections all the time. My favorite example is when Cleveland City Council President George Forbes, a black man and a Democrat, ran against State Senator Mike White, also a black man and a Democrat. All of the sudden, race and party were stripped from the election. White won and was mayor for three terms, but Forbes could just as easily done the same. The point is the Electoral College serves no real purpose anymore other than to send a bunch of campaign workers banging on my door to try and elect a guy to vote for president on my behalf. As often as not, that person will vote for someone I did not. All perfectly legal. But not right at all. Remission: Too Dark To Run? My running plans for the summer did not pan out the way I wanted. I decided in September I’d try again in February. Why February? February in this part of Ohio tends to be warmer. Some years, we have frequent snow. We did this year. Usually, though, the spring thaw starts a little early In Cincinnati, the February weather hazard is rain. I can deal with rain. But February has one advantage November does not have. Lengthening days. If I had been able to sustain my running habit a little better, this would not be an issue. Once in proper shape, I have no problem with running out in the deep freeze in the dark. But after sunset, which this weekend will start around 6 PM and progress until 5:18 by the Winter Solstice (or the end of the world, if the doomsday prophets are right about the Mayan calendar), I don’t really feel like dodging traffic, catching my breath, and dealing with shin splints all while hoping I can find my way around some of the less-lighted sections of the neighborhood. It’s not that I’m lazy. I just want more sunlight. In February, the weather is getting warmer and warmer as the days get longer. So instead, I’ll be using the resistance band, doing situps (which I should be doing anyway), and taking the odd lunchtime walk, even though it’ll be cold as hell from December through Ground Hog Day. Our exercise setup is handy. It centers on a frame that holds a heavy bag (which has come in handy since we bought it a couple of years ago) that sits only ten feet from my desk. Workout and jump right into homework. Or writing, as I get a month off from school starting in early December. This is good because I suspect I’ll be a little more devoted to exercise if I don’t have to leave the house before doing it. Which means I’ll exercise more. I need to. Obviously, diet is not working out, or I’d be telling you I’m finally below 270 pounds by now. If you grew up in the Midwest in the late 1970’s and 1980’s, Bruce Springsteen probably spoke to you. He came roaring out of Asbury Park, New Jersey in the mid-1970’s with a rather large band, the E Street Band, backing him up. Springsteen and E Street started out in the early seventies as one of those bands that would backup the great Chuck Berry as he barnstormed across America. They eventually put out their own album, Greetings from Asbury Park, NJ, an earthy, back-to-basics recording. 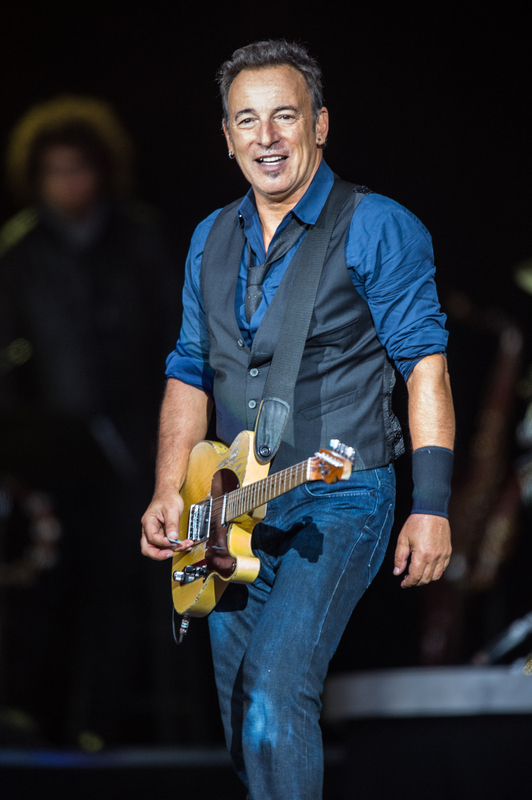 Springsteen had put E Street together over the course of the 1960’s working in such bands as Earth (not to be confused with the early version of Black Sabbath) and Steel Mill. All that was missing from this line-up was the Big Man, sax player Clarence Clemons. 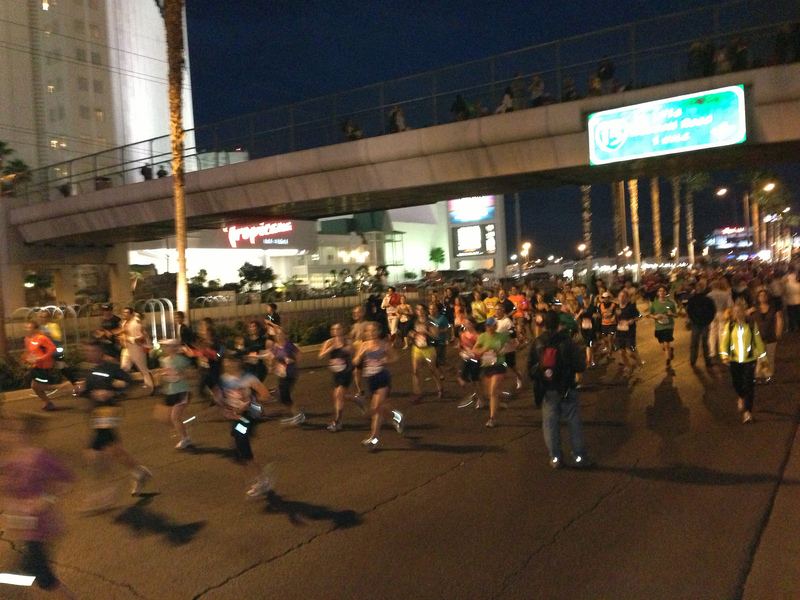 But it wasn’t until the epic Born to Run that they broke out. America was ready. Disco was encroaching on rock’s territory, and rock itself had gotten bloated and pompous by the mid-seventies. Since America lacked Britain’s anarchistic bent, some plain, blue collar rock was in order in lieu of punk. Springsteen delivered. Born to Run is an epic. “Tenth Avenue Freezeout,” “Thunder Road,” and the title track all hark more to Tom Waits with a bigger vocal range, a lot more volume, and a harder edge. And possibly the album’s most powerful track, “Jungleland,” is the song that launched a thousand crime short stories, not to mention a few novels, and quite likely, The Sopranos. (Doesn’t hurt that E Street’s “Miami Steve” Van Zandt, aka Little Steven, was a cast member of The Sopranos.) They were here to stay, especially with the more socially aware Darkness at the Edge of Town. It’s the eighties, though, that made Springsteen the standard bearer for a working class groaning under the weight of industrial decline. Beginning with The River in 1980. The track “Hungry Heart” begins, “Got a wife and kid in Baltimore, Jack/I went out for a drive, and I never went back/Like a river that don’t know where it’s flowing/I took a ride, and I just kept going.” Just a stark slice of life of what people struggling to survive were going through. In this song, the character tries to run away from his problems. But if you didn’t get the message on The River or pick up on it on the acoustic Nebraska, Bruce got in your face with 1984’s Born in the USA. I saw Bruce and E Street perform during the Super Bowl halftime show a few years ago. It was a refreshing change from “wardrobe malfunctions,” not as painful to watch as Black Eyed Peas trying to perform live (They should follow Steely Dan’s example from the 70’s and just stay in the studio), or as disappointing as The Who. Springsteen live is still a carnival, and on the cusp of 60, Bruce was still working the stage like an amped-up kid just out of high school. It brought back memories of WMMS playing all his albums in their entirety, before Clear Channel wrecked radio. PI Lew Archer was described by his creator, Ross MacDonald, as being so two-dimensional that he would disappear if he turned sideways. He said this when his Archer series had broken away from following Raymond Chandler’s template in plot and style and moved into a more literary direction. Yet, having just read Sleeping Beauty, I think MacDonald sold his character and himself short. We don’t know much about Lew Archer’s personal life. He used to be an investigator for the DA out in Long Beach, California. He’s divorced. He lives in an apartment in Santa Monica. (Gone is Santa Teresa, Archer’s fictional place of residence that he bequeathed to Sue Grafton for her Kinsey Millhonne series.) And at the beginning of the story, we know he’s no fan of the oil industry. Flying back from Mexico, he sees an oil spill not unlike the BP spill from a couple of years ago spewing crude into the Pacific, a site Archer compares to a dagger in the heart of the Earth. He has no idea he is about to step into the middle of that spill almost literally. After giving a woman a lift home, he finds sleeping pills missing from his medicine cabinet. He soon learns the woman is the daughter of a wealthy oil family, a family at the center of the controversy surrounding the current oil spill. Soon, he learns there has been a kidnapping, or at least a ransom demand. As Archer pulls at the threads of the case, he discovers there is much more than meets the eye. The roots of the case date back to World War II (This is in 1973.) and an aircraft carrier destroyed in a refueling accident off Okinawa. The theme of family secrets coming back and haunting the next generation is one that runs through MacDonald’s work from his debut, The Moving Target. There is the additional twist of Laurel, the missing woman. Many have cited MacDonald’s problems with his daughter and grief over her death as the basis for many of the characters in his later novels. Tom Nolan, in his biography of MacDonald, even quotes some of MacDonald’s friends on the subject. Whatever the source, MacDonald’s novels have an emotional depth that is actually not as common as many of us would like in PI fiction. Ronald Reagan had two role models coming into the White House in 1981. The first was Franklin D. Roosevelt, who came to power during the Great Depression. The American economy in 1981, though nowhere nearly as precarious as it is today, was mired in one of the worst periods of stagnation since the Depression. Reagan saw Roosevelt’s willingness to up-end the status quo as the path to restoring the nation. But where FDR implemented the New Deal to keep America from deteriorating into a Third World country (a term that did not exist until the Cold War began), Reagan would need to reverse course for the crisis he faced. To do that, he would have to turn to his second role model, the quiet, dour Calvin Coolidge. Coolidge, a former governor of Massachusetts, was a contender for the 1920 Republican nomination. Smart money said that Coolidge, who had made his reputation breaking the Boston Police Union in the 1919 strike, rivaled Theodore Roosevelt crony General Leonard Wood. Whoever won the nomination would likely beat the Democratic ticket (which turned out to be Ohio Governor James Cox and Navy Secretary Franklin Roosevelt). But in 1920, conventions were not the primary-driven pieces of stagecraft they are today. Incumbent presidents had to fight to keep their jobs. The anointed heir to the party throne might emerge from the convention as an also-ran. 1920 was no exception. Back-room deals and political bartering resulted the nomination of the handsome, affable Warren Harding, a man with Bill Clinton’s libido, but not his intelligence. To give weight to the ticket, the GOP tapped Coolidge as vice-president. Harding, as discussed in this space recently, was in over his head. He famously predicted the job would kill him, and in 1923, it did. Coolidge, a classic New England Puritan, became president in a manner befitting a plain, simple-living man from Vermont. He was sworn in late at night by his father, a notary public, in a Vermont farmhouse with no power and no indoor plumbing. It was probably a good thing, too, as Harding had the most corrupt cabinet since Ulysses S. Grant half a century earlier. 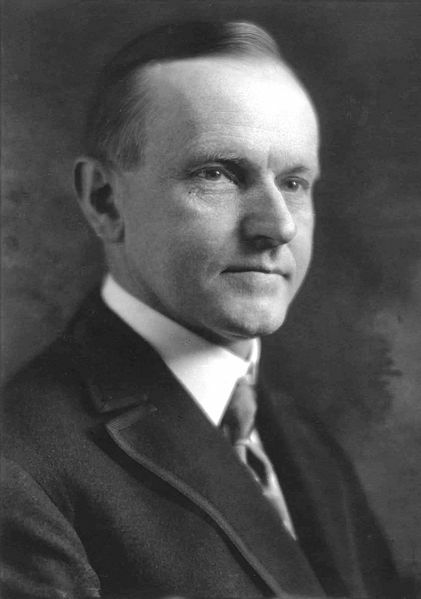 Coolidge quickly crafted his image as “Silent Cal,” a man who said very little. Ironically, it was Coolidge who first used the new medium of radio to regularly address the nation, giving the president a direct line to the people. He also started the tradition of broadcasting the State of the Union address, an absolute novelty in 1923. Many of those same moves lifted controls that might have prevented the Crash of 1929 or at least mitigated its effects. Whereas we had 70 years of both Keynesian and Milton Friedman economics to guide us in 2008, the consequences of Coolidge’s hands-off approach to the economy were hard to predict. It was a new world, one where the United States occupied a position now occupied by China in the world, a nation with a rapidly growing economy and poised to become the world’s commercial superpower. Most of the institutions we now take for granted, even after 2008, did not exist, or were so new that no one quite knew how to utilize them. However, while Coolidge shares some of the blame for the Crash of 1929, what cost him some of the later respect of historians, even after a brief renaissance in his reputation in the 1980’s, is his passivity. Not only was Coolidge reserved, he was hardly decisive. Many of his policies came from letting cabinet members such as Harlan Stone, Herbert Hoover, or Andrew Mellon pick up the ball and run, simply giving their moves his stamp of approval. No one expected him to be as bold as Theodore Roosevelt or his cousin Franklin. Certainly, the nation no longer had the patience for the Sheldon Cooperesque Woodrow Wilson. But lesser lights such as Harry Truman, Lyndon Johnson, and even the paranoid Richard Nixon possessed a requisite amount of gumption to make bold moves when called upon. Only Nixon could go to China, and only Coolidge could have given weight to unpopular banking regulations that might have kept the economy from overheating. Coolidge was a good president for his time, but he could never be a great one. The job requires far more imagination than he had. But he was damn sight better than the empty suit he replaced, Warren Harding. One August, we had a series of freak storms blow through that did all sorts of house damage. We needed a new roof. We were cleaning parts of our neighbor’s tree out of the yard well into the following spring. It also tipped our privacy fence into the neighbor’s yard. That was 2009. Nita and I went out into the backyard to look at how we might fix this. The post clearly had no anchor left, which puzzled me. Weren’t fence posts that size supposed to be anchored in concrete? The chainlink fence originally installed to keep AJ in the backyard as a toddler sits anchored by five such concrete bases. Dump a bag of Quikrete in a hole, add water, and set your post in. Simple, eh? Neither here nor there. Nita and I had zero experience with fences. We went to Ace, bought a post-hole digger and a new spade and marched out to the backyard on a mission. After about three hours of studying the fence, two aborted attempts at using the post hole digger, and not coming up with anything better, we planted two temporary posts and looped a rope between them and the fence to hold it up. It was a repair job worthy of There, I Fixed It. Then we left it for the rest of the summer. That was 2009. In 2010, I got laid off. In 2011, it rained so much the ground around the fence post was mush. Come 2012, I noticed the fence had fallen back even farther than when the wind blew it down. In that time, we’d already repainted the living room, made a couple of attempts to fix the bathroom walls, painted the garage, replaced the roof, and created a second patio in the back corner, which, if I’d made the investments in the proper plastic lawn furniture, would have afforded me the perfect view of the sagging fence and the now-ruined redneck repair we’d done on it. I’d had it. Three weeks ago, I marched around the block and left a note on the door of our neighbor to inform her I was going to be trespassing on her property that weekend. I was going to fix this damn thing once and for all. I worried about digging the hole for the post. That would be the hard part. Putting the fence back together – Hey, the wind had the disassembly part – would be the easy part. String an extension cord over the fence, eight screws, boom. Right? Turns out the sagging post did have a concrete base. The storm had simply snapped the top off. There was no way I would be able to remount the fence onto a new post. The posts we used for our entry to There, I Fixed It remained. They did nothing anymore, but they were solid. I dug up around the hole for the old posts, dumped in a sack of Quikrete, and put in what are now two temporary posts. Wait one day for the concrete to dry, and we’re done. Right? I looped a rope around the two new posts and decided to come back later to fasten everything into place. Only it started raining on the nights I had time to work on it. 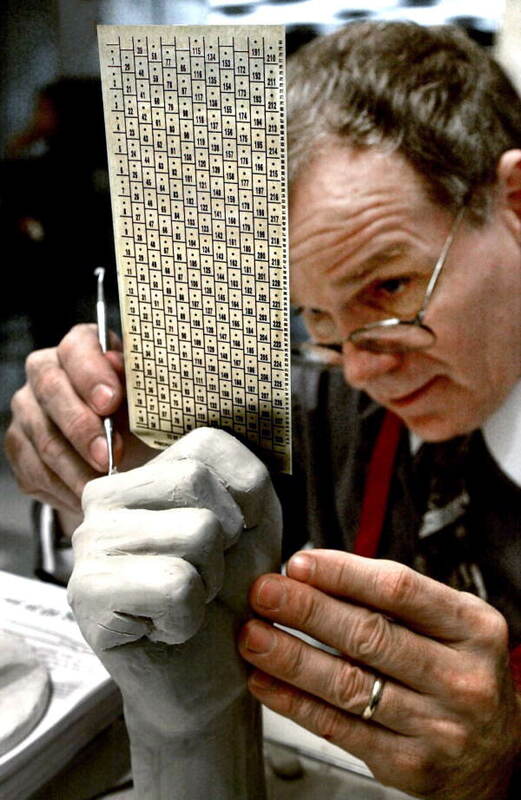 My associates degree came from a two-year technical college. Most of the classes were done online or even in the workplace. As you can imagine, the demands on my time, as long as I only took two or three classes, were not that great. In fact, the classes that taught programming languages, especially once I learned C#, mainly consisted of learning a new way to write a “Hello, world” program, followed by if statements, loops, and eventually talking to a database. I do this stuff for a living now. Then I get to Wilmington College’s Cincinnati campuses. They have a program where I can take three classes a semester, but only have to take two at a time. My advisor suggested taking three during the summer. Since there are no accelerated courses in the summer, that ain’t happening. When I started my first class at Wilmington, the prof said first thing, “We expect two hours of homework time for every hour you spend in the classroom.” I hear that all the time. Nita and AJ, who both attend University of Cincinnati, Blue Ash, get that, too. Except most of the time, that doesn’t pan out. Then again, they are both taking technical majors. I am taking Business Analysis so I’m not a complete geek when I enter the consulting phase of my career. And boy, they’re not kidding at Wilmington. Currently, I take a Society & Business class that runs the entire semester. That class is 2 1/2 hours on Tuesday nights. OK, that’s five hours of homework a week. I can do that easily enough. But both accelerated courses, Introduction to Management and now Modern Short Story, are four hours every Saturday morning. (I am soooo looking forward to December 15, when I can finally sleep in!) That’s eight hours a week. Uh-oh. My job is 40 hours a week with 5-7 hours of commute time each week. Somewhere in there, I have to write. Somewhere in there, I have to spend time with my family. I have to exercise, get groceries, deal with car breakdowns, illnesses, bills… Yeah, 13 hours is hard. I did have one classmate who is taking four classes this semester while working full time with a family. She takes two accelerated classes at a time. That would be 16 hours a week at home. 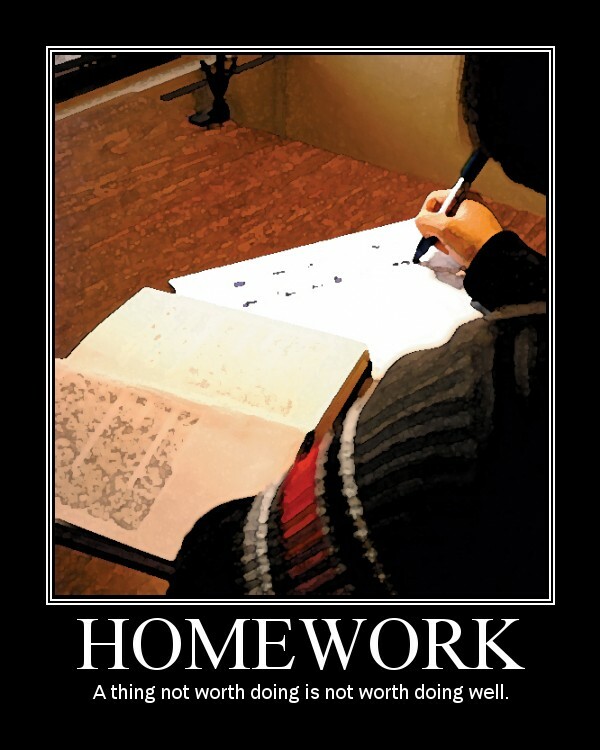 Now I know not everyone’s going to spend that much time working on homework. We’re adults. Life doesn’t stop because we went back to school at roughly the same time as our kids started college. The problem for me is writing. It’s hard to get it in when the coursework is reading and writing intensive. If I mention this problem, I hear, “But you like to write,” and “You’re always reading anyway.” The problem is a term paper on why BP looks rather saintly next to Kerr-McGee (Remember the movie Silkwood? Kerr-McGee did a lot of stuff like that.) doesn’t pay the mortgage. And I’m always reading because I want to, not because I have to. I’m writing this on a Sunday morning, about the only time I have to do it anymore. But yes, I am complaining. I know I committed to getting a bachelors after I finished my associates. So it’s not like I begrudge the work. But it’s taken me most of the semester to find a way to balance out the work and still get writing and exercise and learning a new programming language in. But there is some relief on the horizon. Originally, I wanted to get an MBA if I finished the bachelors by a certain date. (Right now, I can probably be done by 49.) But you get an MBA to impress someone enough to make you an executive at either the company where you work or another one. I work at a small family-owned business. They are not going to make me CEO or vice president of anything in the future. My next job will likely be at a consulting firm or as an IT manager somewhere. The only CEO position on my horizon will be at a company that has not formed yet. And the CEO’s position will not be determined on whether I have an MBA or not. It will be decided by me and Nita playing rock-paper-scissors. So no MBA. Which means no deadline to finish the bachelors. Which means I can take whole semesters off. Good. Because summers are for writing.